Home » News » Chamber news » It’s that time of year! Howell Area Chamber’s Community Guide & Membership Directory Ads are due soon! It’s that time of year! Howell Area Chamber’s Community Guide & Membership Directory Ads are due soon! One of the best, most cost-effective and easiest marketing decisions you can make this year is to advertise in the Howell Area Chamber of Commerce’s 2019 Community Guide & Membership Directory. 2019 Community Guide & Membership Directory will be distributed in early 2019, so ad deadlines are approaching soon! 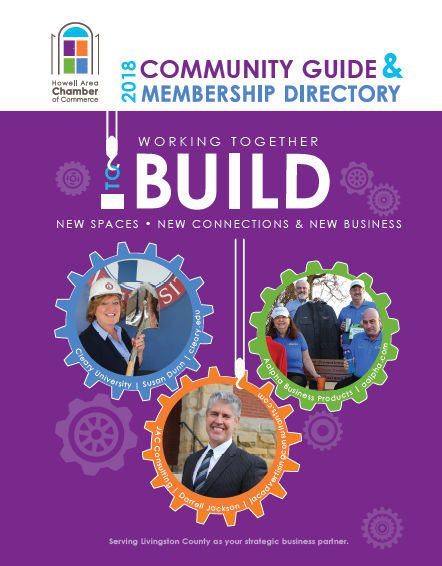 The guide is the definitive source for information on the Howell chamber’s membership, area economic development, and the Livingston County community. Thousands of guides are provided at no cost to members, residents, newcomers and those considering locating a business or moving to the Howell area.The guide helps broaden your customer base, encourages members to use your business, positions you as a key business in the community, and increases your visibility. Additional categories and additional representative listings are available. If you advertise in the guide, you are also eligible to purchase ads on the chamber’s website, howell.org, at a great rate. Guide sponsorships are available, too. Contact Kim Esper at 517.546.3920 or at kesper@howell.org. Hartland Insurance Agency, celebrating forty years in business in 2018, is our premier sponsor again this year. Heart Cardiology Consultants is back again as Supporting Physician Guide Sponsor. New this year, St. Joseph Mercy Livingston Hospital is the Supporting Health Care Guide Sponsor.